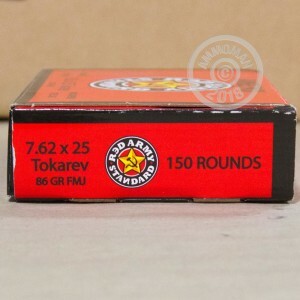 Enjoy the high velocity and flat trajectory of the 7.62 Tokarev cartridge with this economical Red Army Standard ammunition. 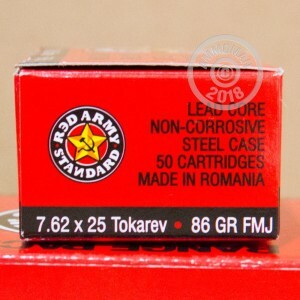 Manufactured in Romania, these new production cartridges fire an 86 grain full metal jacket bullet. Each box contains 50 rounds with non-corrosive Berdan primers and non-reloadable steel cases. The 7.62 Tokarev cartridge was used by some of the most common weapons of World War II including the PPD, PPSh, and PPS submachine guns and the TT-33 pistol. In comparison to other semiautomatic pistol cartridges, it fires a light small-caliber bullet at a relatively high muzzle velocity of around 1,500 feet per second. 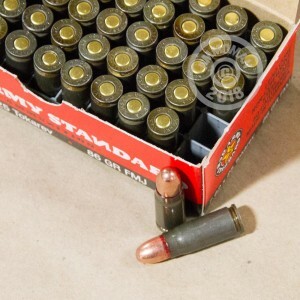 AmmoMan.com is your source for inexpensive, quality ammo from all over the world. Place an order today for $99 or more to qualify for free shipping! Got a lot of this for my TTC works fine, just have to remember to tap the mag to settle the rounds in. Only problem is the bi-metal jacket. Once the magnet hits em the RSO says "NO". Finally found an older outdoor range to let me shoot it. In fact the only range within 100 miles that will. So if you have a range close by that will not care about the bi-metal rounds go for it this is a great price for hard to find ammo.